Do you understand 'textbook English' recordings but not what you hear in the real world? Collins Listening helps students to improve their listening skills by providing real conversations that reflect what they will hear in the real world. To improve your listening skills, you need to hear real conversations. That's why Collins Listening is based entirely on 50 authentic everyday interactions to help you understand what is said to you, whatever the circumstances. From buying a mobile phone to asking for directions, joining a gym to understanding transport announcements, Listening will help you understand what is said to you in real life situations and make sure everything you learn is useful. Twenty 4-page units with exercises and vocabulary work to help you understand differences in pronunciation and vocabulary. Recordings include face-to-face conversations, public announcements, telephone calls, bookings, shopping scenarios and more. Additional real vocabulary for everyday life, taken from the COBUILD English corpus. Collins Listening is part of the new English for Life series and uses authentic material from the Collins Corpus, the world's largest database of the English language. It is suitable for self-study and classroom use, and can help towards Cambridge FCE preparation. 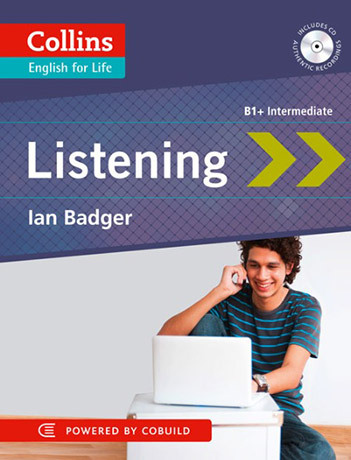 Suitable for Intermediate learners of English (CEF level B1+).